Who would have thought that I would completely fall head over heels in love with a book about zombies? Certainly not me. And yet, The Dead-Tossed Waves reeled me in with the wonderful writing. Carrie Ryan managed to make me fall in love with her characters while unapologetically plunging me deep into her twisted, apocalyptic world. This series is phenomenal, and the second book is even better than the first. This novel revolves around a new character: Gabry, who lives in a lighthouse with her mother in the town of Vista. Honestly, it took time to warm up to Gabry. She was amicable and pleasant, and reminded me of myself with her hesitant, quiet, comfortable ways. But I spent at least half of the book frustrated with her inability to simply allow herself to let go and do things. I understood the fear and the rule-following habit, but I wanted more from Gabry. Thankfully, she does grow up a bit in this novel. And the courageous, loyal, stubborn girl that we catch glimpses of early on finally makes an appearance and stays. Apart from our heroine, there are a few secondary characters of note. The ones that stand out the most in my mind are Catcher and Elias. Catcher is the boy she's known for her entire life, who she grew up with, who she could possibly have feelings for. Elias, on the other hand, is the boy who appears in her life when she most needs him to and affects her in ways that she could never have imagined. Both the boys are important in Gabry's journey, and play a role in who she has become at the end of the novel. As with The Forest of Hands and Teeth, the idea of the zombies definitely scared me. In the first, they were referred to as the Unconsecrated; in this one, they're called Mudo. This time around, they weren't just scary; they were actually beings I felt sorry for. There are questions about them raised here, questions of whether or not they should be outright killed on the spot or given a chance to prove their humanity. While my knee-jerk reaction is obviously to get rid of them, there's something to be said for those who have Returned - especially as they were once family, friends or someone familiar. But the Mudo were not the scariest beings in this book. That honor belongs equally to two groups that we become familiar with - the Soulers and the Recruiters. The Soulers are a religious group who appear to worship the dead, with some members even believing that becoming Mudo is a form of immortality. The Recruiters are the military group who basically control resources and the fight against the Mudo. Obviously, they're of opposite extremes - and just seeing their actions was scary. I was fascinated to learn about them, but the things both groups were capable of is truly disturbing and left me with a bad taste in my mouth (as they were probably meant to do). Story-wise, I can't reveal much for fear of spoilers. The one thing I will say: it is good, solid storytelling. The link between this novel and its predecessor is well-done, but it is a completely different story than before. I liked that it felt original and fresh as I read it, and not just a rehashing of the same story as the first one. The book drew me in completely, and that's certainly a credit to Carrie Ryan's writing. She managed to get to me to care about the characters as much as I cared about the ones in The Forest of Hands and Teeth, or perhaps even a little bit more. I experienced so many emotions - anger, sorrow, joy, fear, pain - as I read, and it was one of the books that invited me to experience them especially intensely. 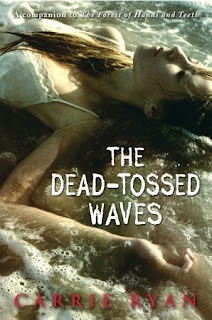 I loved, loved, loved The Dead-Tossed Waves. Carrie Ryan has managed to write a book about zombies that's enjoyable and gripping and really, really great. It was a book that surprised me with how intensely awesome it was, and I would highly recommend it. I actually enjoyed this one SO much more than the first! And I really liked Gabry. Something about her... and Elias... Oh, I miss these two kids! Glad you enjoyed this one! Elias and Gabry were wonderful to read about. The way their relationship was written is absolutely LOVELY and unexpected and INTENSE. Me too! I'm not a big zombie fan, honestly, but I will read this series again for the beautiful writing. I finished the last one as well, though my review won't be up for a while - SPOILER: I LOVED IT. Actually, out of the entire trilogy, my favorite is the third (and my review is coming up!). But this one was pretty interesting, and the writing was still so wonderful. What? You're not an epic zombie fan? I'm so disappointed! BUT I'm happy that you're enjoying this series it's I think my very first experience with a zombie book and I loved it! Then I read Rhianon Frater and she made me a fan forever! hahah. Anyways, I found all the MCs of this series were a little hard to like. I think my favorite was the one in the 3rd book she was less of a whiner. It's also by far the most intense book of the series I can't wait for you to read it! :D Ooh I remember the Recruiters! *shudders* it's funny how in zombie books, sometimes the scariest are other survivors O_O Also, did you see the new covers? They came out just 2 days ago and they are fab! I'm actually not a zombie fan! It takes a lot to convince me to watch zombie movies/shows or read a zombie book. But Carrie Ryan completely won me over with this series. Her writing is absolutely gorgeous. Also - I have read the third book, and I loved it. I know the MC was a bit whiny, but I could stomach it for some reason. Plus, Catcher. You know I love me some Catcher. And I haven't seen the new covers yet. Off to look now! I agree that this one was better than the first! I really didn't like the characters in the first book, so I had a hard time reading it. This one was GREAT, though! It's funny how my co-blogger feels the opposite. So glad you loved this one! I liked the entire series, but my favorite happens to be the last one (even though the MC was incredibly whiny). It's such a wonderful series though! I loved this whole series! Reading your review is giving me the itch to pick them all back up! I'd definitely agree that this one was better than the first, and like you, I loved how Ryan managed to connect the two while making them completely different stories! YES, those Soulers were hella scary. I think the first book was my favorite, just because I am a fan of small religious communities and I loved Mary's curiousity and I am a weirdo. Also, I pretty much love this review as well. And sigh, I like the point you make about Gabry kind of being super hesitant and not brave at all, but then wanting her to break out of her shell. I felt the same, but was also glad for her character development as well.